All industrial pumping equipment, including valves, filters, and lubricators have moving parts that must be regularly monitored for wear and tear. The frequency of inspection will depend largely on the type of media and pressure the equipment handles. Ultimately, the total use life of your valve will not depend on the quality of the valve alone. It will also depend on your maintenance regimen. Regular valve maintenance and cleaning will also mean less breakdowns of the pumping system and when they are necessary, repairs don’t take too much time. Schedule your valve maintenance and inspection at least every six months. You don’t have to wait for a valve failure or leak to do a thorough inspection of your valve. For valves that are not in continuous operation, it may be prudent to test your valves before you put them back in service. You can do separate tests for the diaphragm, stem movement, and the disc and seat. Just as important as the actual maintenance, is keeping maintenance and repair records. A single production system can have tens or hundreds of valves that control the flow, temperature, and pressure of the media running through the pipelines. Because they are such a common component of most production processes, valves often get neglected. Any malfunction with one of your process valves can have tremendous repercussions on the safety of the entire system and the consistency in the quality of your products. Valves don’t have that many moving parts. Still, it is important to ensure they are lubricated as often as possible, especially compressed air valves that must handle extremely high media pressure. Even the best quality valves and equipment will need regular maintenance to continue operating efficiently. For critical moving parts, like the stem packing, enough lubrication must be maintained at all times. In most cases, valves are lubricated by the manufacturer before they are shipped. Yet, it will not hurt to inspect the valve for lubrication and potential damage before installation, as a lot can happen during transportation. Once the valve is fitted to the line, plant managers must immediately create a regular inspection and maintenance schedule. Ideally, all valves in service must be lubricated at every inspection using a compatible lubricant, which the valve manufacturer usually recommends. Lubrication itself is not an ordeal that will take much time or effort. Often, all you do is open the valve and smear the lubricant over the stem packing. Valves undergo extensive use tests before they are shipped by the manufacturer. But this does not absolve you of the responsibility to institute regular inspection and maintenance. Many things can cause valve failure before its projected use life or periodic maintenance date has passed. These include incorrect installation, wrong valve application, and other issues within the application environment that may not be directly attributable to the valve itself. ● It ensures the safety of your personnel and the equipment itself. Valve failures can cause risks like fires and explosions. These will put your personnel at risk, not to mention the disruption of production due to resultant shutdowns. ● Preventative maintenance saves you from having to replace a valve that gets permanently damaged due to a lack of maintenance. Regular maintenance thus prolongs your valves’ use life and saves you money. ● Reduction of fugitive emissions. For valves deployed to control flammable and toxic fluids, regular maintenance is paramount, even mandatory. Any leaks or bursts can cause fires, air contamination, and pollution that will put entire cities, animals, and property at severe risk. The effects of oil leaks and accidental radioactive gas leaks are often catastrophic. ● Your valves are guaranteed to operate smoothly, without any surprise faults. As a result, there are less shutdowns and product quality will be consistent. Some companies may consider it prudent to justify annual maintenance productivity against the Replacement Asset Value (RAV). Maintenance expenses are considered cost effective when they are 2 percent or less of RAV. It is also prudent to factor in the contribution of increased production on the regularity and cost of maintenance. When they spike to as much as 20 percent, you may need to reevaluate the quality of the valves you are using or their suitability for the application. This is almost always the best remedy as opposed to completely doing away with regular, proactive valve maintenance. Reactive maintenance, though very common because of its low expense, isn’t the best maintenance strategy. With this strategy, the valve is operated until it fails, which is when a technician would inspect and repair the valve. Most companies often find that preventative maintenance balances the expense of regular maintenance and the cost of replacing valves. This maintenance regimen will often mean periodic lubrication and cleaning, adjustment, and replacement of parts. But where the budget allows it, environmental and safety regulations make it mandatory, and where the cost of valve failure is particularly high, you must maintain a proactive maintenance strategy. Though it is more expensive, other firms may opt for a predictive maintenance plan. Here, valves are continuously monitored for the onset of degradation or wear. This will help plant managers to isolate potential problems and set the best times for maintenance. Despite your best efforts, there will come a time when you have to replace parts and repair your valves. Even with constant lubrication, the stem packing will ultimately wear down and require replacement. 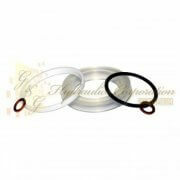 Seals will break, and gaskets will thin out and start to leak. ● Internal leakage - it is important to note that not all valves are designed to have airtight seals. Save for those required to have airtight seals, valves are specified for their Maximum Allowable Leakage (MAL). Any leakage above the specified MAL may point to issues within the valve’s internal components. It could be a worn seal, or the actuator, positioner, or controller. ● External leakage - this is the most common problem with valves. And the implications can be severe for both the plant’s operation and the environment. In most cases, causes of external leaks can be traced back to the stem packing. The packing fails from either poor maintenance or sudden changes in the operation environment. ● Poor valve selection - valves have to be selected for their suitability for their service conditions. Selecting the wrong valve can cause a deadband - where a valve fails to respond to a control signal. If the valve is too small, it will simply be overwhelmed by media pressure. Valve maintenance best practice requires that you don’t only wait for leaks and actuator failure to institute repair. Besides an actual leakage, other indicators that a valve is not maintained regularly are the valve’s repair history, total valve hours, and a low oil gauge. ● Lack of upstream media pressure. Valves come in many different sizes, and so do their repair parts. While it may seem economical to repair only the part that has caused a leak or malfunction, it is best to replace most internal parts whenever you undertake a repair. These parts are also sold in kits. So instead of buying just the one part that has worn out or broken you are better off buying the whole repair kit. Buying one part, only to discover when you open the valve that another may need replacing, will prolong repairs and waste critical valve runtime. When ordering repair kits for pneumatic actuators, it is important to specify what actuator type you are buying parts for. Pneumatic actuators can be spring and piston, double acting piston, or spring and diaphragm. Generally, all pneumatic actuators may either be for control valves or standard on and off valves. 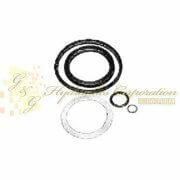 There are also different parts kits for electric actuators. There is a growing problem of fake valve parts that are finding their way into the valve parts supply chain. It is in your best interest to avoid giving business to uncertified valve parts distributors. Needless to point out, most fake valve parts are of a very poor quality. The consequences of using such parts when servicing or repairing your valves are quite grave. Fake parts almost always fail before their specified use life has lapsed. They also do not perform as promised and will likely result in products of inconsistent quality coming off your line. For valves that control oil, gas, and dangerous and potentially toxic fluids, using parts of questionable origin and quality can put your entire operation at risk. Fake repair and seal kits are usually marked by their significantly lower prices when compared against those from traditional, reputable valve manufacturers. Keep a look out for suspicious labeling, overly optimistic performance promises, and warranty terms that deviate from standard industry benchmarks. All G&G Hydraulic Corporation products are 100% factory certified. Most parts distributors will ship parts within five days from date of order. But in cases of complete plant shutdown due to valve failure, parts suppliers can make efforts to expedite shipping. The valve manufacturers and G&G Hydraulics Corporations can help design maintenance schedules and even send their own maintenance technicians to inspect or repair your valves. 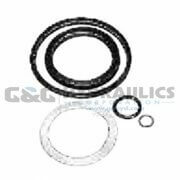 300942 SPX Power Team Seal Kit For P157 And P159 Two Speed Hand Pump, Single/Double Acting UPC #6625..
300914 SPX Power Team Seal Kit For PE182 PE182-50-220 PE183 PE183-2-50-220 PE183-50-220 PE183A-50-22..
300883 SPX Power Team Seal Kit For Hydraulic PA64 Series Air Pump, Single or Double-Acting UPC #6625..
300811 SPX Power Team Seal Kit For P460 And P460D Two Speed Hand Pump, Single/Double Acting UPC #662..
300692 SPX Power Team Seal Kit For P157D And P159D Two Speed Double Acting Hand Pump UPC #6625362636..
300651 SPX Power Team Seal Kit For PE102 PE102A PE102-220 PE102A-220 PE104 And PE104-220 Pump, Elect..
300453 SPX Power Team Seal Kit For C151C, C152C, C154C, C156C, C158C, C1510C, C1512C, C1514C, & ..
300430 SPX Power Team Seal Kit For PA172 PA174 PE172 PE172-50-220 PE172A PE172A-50-220 PE172M PE172M..
300215 SPX Power Team Viton Seal Kit for C552C, C554C, C556C, C5510C, & C5513C Cylinders UPC #66..
300211 SPX Power Team Seal Kit For, Viton C101C, C102C, C104C, C106C, C108C, C1010C, C1012C, C1014C ..
300147 SPX Power Team Seal Kit For C251C, C252C, C254C, C256C, C258C, C2510C, C2512C, & C2514C C..
300116 SPX Power Team Seal Kit For C101C, C102C, C104C, C106C, C108C, C1010C, C1012C, C1014C & C..
300114 SPX Power Team Seal Kit For C552C, C554C, C556C, C5510C, & C5513C Cylinders UPC #66253608..